October 28 and 29 Hey Dublin! Hey London! See you at The BluesFest in October! July 15, 16 and July 29, 30 They Don't Call 'Em Classic For Nothing: How's this for a lineup: Steely Dan; The Eagles; Fleetwood Mac; The Doobie Brothers; Earth Wind & Fire; Journey. The Classic East (Citi Field) and The Classic West (Dodger Stadium) will be the scene for these late July blowouts. One ticket, 2 nights, 6 legendary bands makes for slammin' great music -- and lots of it. April 2017 With a handle in your hand, indeed: This April, why not spend a few days in Steely Sin City? Between April 12 and April 29, Steely Dan is Reelin' In The Chips for a nine-night residency in Vegas. Tuck three SoCal dates in there and you've got yourself a Steely Spring Break; Westward Ho! Summer - Autumn 2016 Autumn In New York: In 2016, Steely Dan's autumnal residency at New York City's Beacon Theatre serves up 10 very special shows, Oct 12 - 29. The 1973 classic Countdown to Ecstasy joins the Album Night rotation, and Rickie Lee Jones is Special Guest for selected performances. See the complete schedule on the 2016 dates page. The Dan Who Knew Too Much: Exciting news about Steely Dan's 2016 Tour is spooling out, as we speak, on the Official Steely Dan Facebook Page. (Our on-site dates page is here). Indeed, in 2016, the Facebook Page is often where officially confirmed dates, events, and special announcements will appear first. They're the quickest draw in town, folks. So when it comes to announcements, confirmed events, and news, SD @ Facebook will often shoot first. ...and among aforementioned news items, a very exiting one is that music legend Steve Winwood will co-headline the summer leg of dates! We already know from experience that this will be one spectacular night of music! Summer 2014 Ain't No Fairy Tale: Join Donald, Walter, and their now-legendary group of supporting musicians on their Jamalot Ever After Tour, swinging hrough North America Juy 2 - Sept 17. Summer, 2013 Mood Swings 2013: Come along with with Donald, Walter, and their Bipolar Allstars - Featuring The Borderline Brats on the 2013 Mood Swings 2013: 8 Miles to Pancake Day Tour. It all starts July 19 in Atlantic City. November, 2011 Steely Dan in 2011: Donald and Walter conduct some Shuffle Diplomacy July - November with 'The Miles High Big Band' and featuring 'The Embassy Brats'. A hot and historic double-bill is built when the legendary Steve Winwood joins The Dan for the Australia and New Zealand leg. April, 2011 Roger Nichols, R.I.P. Walter Sear - 1930 -2010: Our friend Walter Sear, owner of legendary Sear Sound in New York City, passed away last month. 2009 Touring 2009 was a 2-season, 70+ show affair: A Left Bank Holiday in Europe, and an extended Rent Party in North America. Final show was in Montreal on Nov 28. Think Fast, Steely Dan: Visit the Tour 08 page to see if Steely Dan will hit your burg this year. 2007 Heavy Rollers: May through September, Donald, Walter, and their 10-piece band played the odds with dates in the U.S., Europe, Japan, Australia, and New Zealand. Here's the tour archive. September, 2006 Off The Road Again: Summer 2006 Steelyard 'Sugartooth' McDan (and the Fab-Originees.com) Tour is history. Visit this page for the official documents, depositions, photos, etc. 2006 In support of sundry solo endeavors, both Walter and Donald are eponymously online. Fagen releases his third solo album Morph The Cat in March 2006, and mounts a spring tour. Becker continues work on his second solo CD. 2005 Everything Must Go ---> Gone up and Went: With all the excitement of the most recent promotional season behind us, steelydan.com powers down to a comfortable archive-mode idle. Any real Steely Dan news, and we'll post it here and send a newsletter. July - October, '03 End of Another Road: The "Everything Must Go" Tour which began July 23 in California ends Oct 11 in Honolulu. :: Touring '03 Index is here. :: Band Bio Page is here. :: A Few Tour Pics are here. February 11th, '03 NPR feeds "Piano Jazz with Marian McPartland" with guests Becker and Fagen. Autumn, '01 Back To Work: Becker and Fagen return to the studio to record a batch of new tunes. 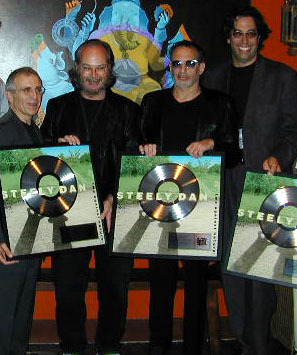 December 1, 2001 MIXing It Up: MIX Magazine awards Steely Dan their Les Paul Award at the Mix Foundation's 17th Annual Technical Excellence & Creativity Awards Dinner in New York City. The award is presented to Donald and Walter by Larry Carlton and Les Paul. (The Clair Brothers also win the Tour Production Award for their sound work on Steely Dan's 2K Tour) A few pictures are here. May 11 & 12, 2001 What's Up, Doc? : Becker and Fagen receive Honorary Doctor of Music degrees from The Berklee College Of Music, and attend students' tribute concert of the music of Steely Dan. Coverage is here. March 19, 2001 Should We Demand A Recount? : Becker and Fagen are inducted into the Rock N' Roll Hall Of Fame. :: The history of their crusade is here. :: A related auction of interest is here. August, 2000 Keep Them Doggies Rollin': The North American leg of Steely Dan's 2K Tour wraps up, and the touring party heads to Europe for the remaining 15 shows. June 24, 2000 Honored: Becker and Fagen are voted "Songwriters Of The Century" by the Popular Music Composition students of the Lincolnwood IL school district. June 6, 2000 The Dan Get Plush: The Home Version of Steely Dan's PBS "In The Spotlight" Special - Two Against Nature: Steely Dan's Plush TV Jazz-Rock Party - is released in DVD and VHS formats. June, 2000 Me Myself & Don & Walt: The songs of Steely Dan take pride of place in the soundtrack for the Farrelly Brothers' new movie, "Me Myself & Irene", which includes 11 Steely Dan covers performed by various artists. The movie stars Jim Carrey and Renee Zellweger and opens June 23. The soundtrack will be released on June 13. May 22, 2000 ASCAP Honors Becker & Fagen: Walter and Donald are presented with the Founders Award, ASCAP's top honor for lifetime achievement in songwriting. May 14, 2000 "Two Against Nature" Tour Begins: Steely Dan kicks off their 2K tour in Japan on May 14. North American dates begin June 1, with European dates to follow. Full touring schedule, news, and reports are here. March - May, 2000 Seems Like Old Times: Steely Dan's first studio album in 20 years - Two Against Nature - is released on February 29. It debuts at #6 on the Billboard 200. In addition to two TV Specials (see January 2000 item below), promotional appearances throughout the spring include the David Letterman show (March 3), the Today show (May 5), several radio specials, innumerable press interviews [see a sampling here], and two internet chats [transcripts here]. January, 2000 SD Tapes Two for TV: SD descended on Sony Studios in New York city to tape a PBS "In The Spotlight" special, featuring both performance and documentary/ interview footage, which aired on most PBS affiliates during March. The home version DVD and VHS will be released this summer by Image Entertainment. A few days later Steely Dan taped an episode of VH-1 - Storytellers which aired in early May. See a few pictures and fan reports from Sony Studios here. December, 1999 Snubbed Again: The voters for the Rock and Roll Hall of Fame have once again seen fit to overlook Steely Dan. It seems as though Donald and Walter's vigorous lobbying during the '97 season all went for naught. But not to worry -- vengeance will be theirs (and ours)! Everybody start training for The Hall Of Fame Induction/Tribunal For Rhythmic Justice Night! !